A body made from aluminium, handcrafted leather trim and an extraordinary design – the vehicle sends Hubert Waltl, Head of Audi Toolmaking, into a rapture the instant he lays eyes on it: “This car is something really special.” And, indeed, the car in front of him is no ordinary car – it’s the Auto Union Type C pedal car which AUDI AG has brought onto the market as an absolute first. No other car manufacturer offers a pedal car built so elaborately and to such a high standard. How did Audi stumble upon this idea? “We needed a highlight for our collection which conveys the brand message and, at the same time, is spectacular enough to find buyers,” says Katharina Wicker, Head of Audi design – Lifestyle Articles. And this was how the idea came about to design a pedal car that mirrors the company’s heritage at first sight. The Type C Grand Prix racing car provided the ideal blueprint for doing this. 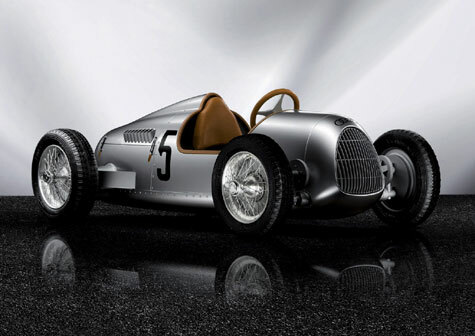 The Auto Union Silver Arrow dominated the world of motor racing in 1936, racking up a total of ten Grand Prix victories. Furthermore, the Type C is one of the best-selling heritage models in the range of Audi miniatures. The pedal car will therefore be an exhibition piece for “grown-up” fans too. The car’s execution called for a great deal of technical know-how and creativity. For a start, how large should the pedal car be made? How close should it keep to the original in order to nevertheless demonstrate the quality and workmanship of a true Audi? Which materials are best suited to underlining the Audi brand values of sophistication, progressiveness and sportiness? “The greatest challenge of all was transposing a historical model to a pedal car for children whilst remaining as faithful as possible to the original,” reveals Achim Badstübner, director of the Munich design studio that created the first draft designs. Those responsible for the project eventually decided to build the pedal car on a scale of 1:2 to make it large enough to accommodate budding racing drivers up to 1.35 metres tall. The technical drawings originated in Audi’s own tool shop. And in true keeping with the premise “designed by Audi, produced by Audi”, special tools and jigs were purpose-designed for the pedal car’s manufacture in the Audi tool shop too. The pedal car is made up of over 900 individual parts. It features a hydraulic dual-disc brake and its speed is controlled via the seven-speed hub gear with back-pedalling brake function. Further technical highlights include the aluminium space frame and the body made from aluminium panelling which, just like on the full-size Audi models, symbolise the brand’s expertise in the field of lightweight design. The seats, framing and steering wheel have been upholstered in leather by a bag-maker, as in the Audi TT, while the elegant spoke wheels have been custom-made. And because this pedal car seeks to replicate many different aspects of the racing car on which it is modelled, the steering wheel can be removed to make getting in and out easier, just as on the original. The prototype of the pedal car was unveiled to the public for the first time at the Paris Motor Show in autumn 2006. Visitors to the show were instantly enthralled. “Lots of people even wanted to buy the exhibition model there and then!” recalls Katharina Wicker. 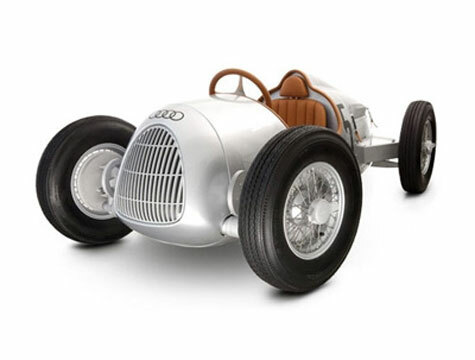 The pedal car can be ordered from the Audi importer for the specific country, who will also be able to provide details regarding the respective price.